Chicken Enchilada Verde Casserole is what I call it. If you speak Spanish, you might call it Enchiladas Para la Mujer Perezosa (Lazy Woman's Enchiladas)! It's for those days when dividing the filling among a bunch of tortillas, rolling them neatly and fitting them attractively into a baking dish is just too much for you. Or maybe I'm the only one who has those days? Because I prefer to make chicken enchiladas with flour tortillas, I first made this with flour. Then I tried it with corn tortillas (sooooo good!) and never looked back. If I were making this for a company dinner, I'd serve it with a salad, beans and my Mexican Rice. But for a busy weeknight, it's just this and some steamed broccoli. Still very satisfying. And leftovers reheat beautifully in the toaster oven. Where do you stand on the enchiladas versus enchilada casserole issue? My friend Jo rolls her eyes at the very idea of rolling enchiladas and always does a casserole. I'm definitely coming around to her way of thinking! 1 Heat skillet and add olive oil to it. When oil is hot, place chicken thighs or breasts in skillet and season with about 1/8 teaspoon each salt and pepper. Cook, covered loosely, for 12 minutes. Turn chicken and season second side with about 1/8 teaspoon each salt and pepper. Cook, covered loosely, for another 12 minutes. Check for doneness; larger pieces might require a few more minutes. 2 Remove the chicken to a dinner plate. In the same skillet (no need to clean it) with the oil left from the chicken, cook onion for 5 minutes (or longer, if you like). Add bell pepper and continue cooking until tender, about 5 minutes. 3 While the onion and pepper are cooking, shred the chicken, using two forks; place in a 1-quart glass measure. You should have about 2 to 2 1/2 cups of shredded chicken. Add the onion and bell pepper to the chicken. 4 In the same skillet (again, no need to clean it), melt the butter and blend in the flour, chili powder, 1/2 teaspoon salt, cumin and 1/8 teaspoon black pepper. Cook over low heat, stirring constantly, for 2 to 3 minutes. Gradually whisk in the broth, bringing the sauce to a simmer. When it begins to bubble, continue cooking and whisking for 5 minutes. Remove from the heat. 5 Stir 1/2 cup of the sauce, along with the sour cream, diced green chiles, 3/4 cup of the cheese and 1/4 cup crushed tomatillos, into the chicken. Taste and adjust seasoning; you might want to add about 1/8 teaspoon each salt and pepper. Lightly oil or spray a 13x9x2-inch baking dish. Spread 1/2 cup of sauce and 1/4 cup of crushed tomatillos over the bottom of the oiled baking dish. 6 Place a third of the tortillas in the baking dish. Spread half the chicken mixture over the tortillas. Add half the remaining tortillas. Spread remaining chicken mixture over the tortillas. Add the remaining tortillas. Cover with remaining sauce and crushed tomatillos. Sprinkle with remaining cheese. Cover and refrigerate until an hour before serving time. 7 Preheat oven to 350F/180C/Gas4. Bake for about 40 to 45 minutes, or until bubbly. Let stand for 10 minutes before serving. Serve with sour cream and a squeeze of lime; garnish with cilantro or sliced green onions. Stephanie, thank you! And yes, please do let me know if you make it! You might have some helpful hints for me. Oh, I roll with the roll, of course! Just makes it easier to skewer a balance of ingredients. Also can make it hand dippable if it’s not already garnished in sauce. Not pretty, so maybe it’s more a solo meal that way. You’re reading a bachelor here. That said, casserole is no dealbreaker – looks very good, as does all your stuff. Well…except that broccoli you mentioned. Broccoli: what makes a good chicken go bad. Yum, Yum, Yum, Yum, Yum,! It's been a long time since I made a Chicken Enchilada Casserole. I guess it's because I go out for Mexican often enough that I don't often make it at home. Thankfully we have good restaurants in the area. Even still, this looks to hard to resist, I'm going to have to make it. BTW, I saw frozen tomatillos in the freezer section of Trader Joes but have not found the Muir Glenn caned ones--yet. Also, I've never been able to find cans of green chillies hotter than mild. I suppose a good Mexican grocery store would be the best bet. I am printing your recipe. For one thing, I use the mild chilies and that isn't hot enough but also - I want to try your recipe as I think it looks better! So glad you shared. Sully, thank you. 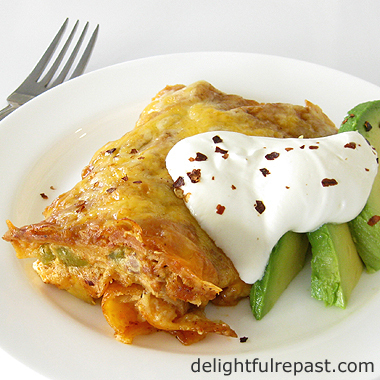 And, no, even the neatest of rolled enchiladas is not for eating out of hand. It, by its very nature, has loads of sauce. What you need is just the filling rolled in a tortilla--it's called a burrito. And a little broccoli on the side wouldn't kill ya! Richard, thanks. The Muir Glen tomatillos are in jars, right next to the canned tomato products. If your store doesn't have the tomatillos but does have the others, your store can easily order it for you. Thank you so much, Bernideen! I hope you'll try it soon and let me know how it turned out for you! Thanks, Amy! Wish I had some leftovers! This sounds so, so good! I'll definitely try this. The only advantage to the single rolled tortilla is that a casserole has no observable boundaries, whereas a tortilla is a unit. For someone like me who loves this ingredient list, that could be a problem. :-) Thanks for the recipe. It looks divine! My casserole has never looked this GOOD! My husband is usually in charge of rolling enchiladas and burritos. I am not so great at it. Casseroles are great...you get the same great taste but not the extra time! This looks delicious! I am a big fan of salsa verde! Thanks, Judy! I know what you mean about the "unit/no observable boundaries" thing, but I wouldn't have put it so beautifully! Angie, I can't believe *that* -- you are the queen of beautiful dishes! Wow Jean you are making me hungry! This looks so good! Thanks for sharing the recipe with us. Julie, thanks! I'm getting hungry looking at food pictures right now myself! Hi friend! This casserole looks like perfect comfort food and one that I'll be making soon. Also, I somehow missed your sourdough post. I received some starter about 13 years ago, which is supposedly from the Civil War. I have been making bread with that started ever since. Like you, I've learned that I can revive it and only make bread with it about every three weeks. I'm addicted to the bread for my morning toast! Thanks, Kitty! I'm so glad you're a sourdough baker, too. I shall think of you having your sourdough toast in the morning as I'm having mine! I hope I find those jarred crushed tomatillos! Any store that carries Muir Glen should be able to get it for you even if they're not stocking it yet. bj, that's wonderful! I do hope everyone likes it. If they do, be sure to tell them about my blog! :D I think you're going to like tomatillos. Yum! You can count me in the casserole camp--the easier, the better for this lazy cook. Hee! Thanks for the visit and kind comments, Jean. Margie, thank you! Happy to find another teaholic! It looks and sounds so tasty and inviting ... thank you for sharing this recipe of yours, my friend, your recipes are truly unique ! Thanks so much, Dany! I hope you have a wonderful weekend as well. I should be cooking right now but will probably put it off until tomorrow. This looks scrumptious Jean and Mexican is something we ALL love! I live in South Texas , where enchiladas are a staple. I can't wait to try yours. I love the name in Spanish.Enjoyed visiting! Jacqueline, thank you. And I think that's true -- I don't know anyone who doesn't like Mexican food. Thanks, Laura! Hope you'll try it soon and let me know how it turned out for you. Coming from South Texas, your opinion will carry extra weight! A casserole sounds like a great idea because whenever I try to take an enchilada out of a pan, it always breaks apart anyway. That certainly looks so very delicious. Carol, that's true! I didn't think to mention it, but it happens all the time! Thank you, Margaret. Happy travels! Looks and sounds delicious Jean. Thanks, Tony. It's something I could happily eat every week and not tire of it. I gave you a shout out on my blog White Spray Paint. This looks absolutely fabulous. We will be trying this! Thanks for sharing the recipe! Oh my gosh! This sounds beyond yum! Laura, thank you so much! And I like your blog, too! Mrs T, thank you! I hope you do try it soon and let me know how you liked it. Thanks, Mrs Tuna! Can't wait to go see what's going on in your world! Jean your chicken enchilada's so delicious, can you share some with me. Thanks for sharing with Hearth and soul blog hop, pinning, tweeting and featuring on this week's hop. Swathi, thank you so much! I so appreciate your sharing and featuring it! Hi Jean, it is so nice to meet you! Thank you for visiting my blog and leaving a comment. This chicken enchilada casserole looks so good; I will definitely be trying it. We love enchiladas but sometimes it's easier to make it like a casserole instead of rolling each one up. I'll be sure to pin one of your photos to my Pinterest board. Thanks for the recipe! Melanie, thank you! And thank you for the Pin -- much appreciated! Thanks, Diane! I hope you'll give this a try and let me know what you think. Hugs to you, too! This enchilada looks tasty & delicious. Found your casserole featured on Hearth and Soul Blog Hop March. Thank you, Joy! Nice to meet you! What a beautiful casserole, Jean! I love how full of flavour it is - and it's great leftovers reheat well too! Thank you for sharing your Chicken Enchillada Casserole with us at the Hearth and Soul Hop. Stumbled and sharing! April, thanks so much -- your stumbling and sharing is much appreciated! ohmygoodness, this is one of those dishes that I'd make a pig of myself over. This looks delicious Jean, pinning this one. Lea Ann, thank you! And it IS "one of those dishes" for *me* -- I ate waaaay too much! 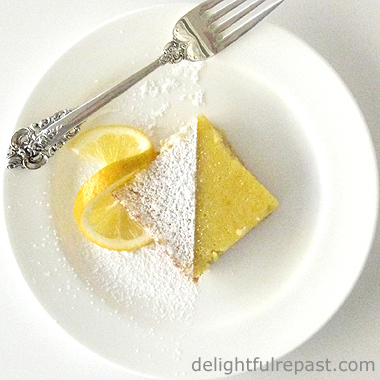 What a perfect recipe for entertaining, Jean! We think I would still roll them sometimes, but for the most part it seems easy and looks quite good as is. Have a great weekend! Don't know why it took me so long to respond to this one, Jean. So, so yummy! The casserole is a great way to go--somehow not so messy. As always I can taste you got the right flavoring even before I eat it! Such a great combination of flavors! Sue, thanks so much! I hope you'll try it soon! 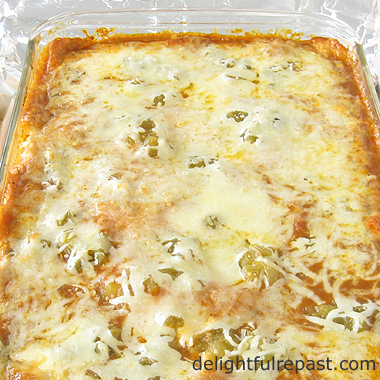 I love the term Lazy Woman's Enchiladas and the idea of a casserole is great! Thanks, Tandy! The casserole does save a bit of work AND can be done in less space!